Volkswagen (VW) has developed an electric bike with the concept name - VW Bik.e. This unique bike folds down into the spare tire compartment of your car's trunk. As you drive along in your car, it will charge the battery of the bike so when you'll arrive to your place of your destination the bike will be fully charged. There is a big change that this concept will have to move from the concept page to the brands page because apparently, the company is actually having serious intention to actually sell this bike or maybe even offer them as an added option to new cars sales. We have a special company within our organization that sells all kinds of products, supplementing our cars… This team is currently looking at this vehicle and is establishing a viable business case." Lithium-ion battery which is located inside the frame - Great, no problem here. Fold down into a spare tire compartment size - Great! 12.5 miles on a charge - This is quite low when comparing it to other electric bikes on the market. 12.5 miles per hour - Again, this is also quite low. 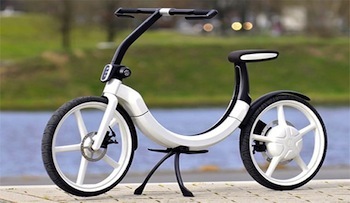 Usually, modern electric bicycle are getting restricted to a maximum speed not because of poor technology but because of laws and regulations. No pedal assistance means that if you run out of juice (battery empty) you are going to be stuck. Also, you can't help the bike accelerate from stop and prolong the basic range of motor only operation (12.5 miles). It is certainly lack an important advantage that a full e-bikes (with pedals) would have. There could be an issue ‫whether‬ this concept complies with the EU regulation or not. 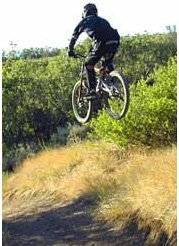 Th EU regulation states that any e-bike must have pedals and the motor can't operate without pedaling.